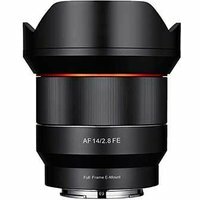 Specifically designed for Sonys full-frame FE-mount compact system cameras, the Samyang 14mm f2.8 AF Lens is one of the first in over 40 years of Samyangs line of optics to come with autofocus (AF). In addition to fast, reliable autofocus, this ultra-wide-angle lens comes with a fast f2.8 maximum aperture to allow for great low light performance and incorporates three aspherical and two extra-low dispersion elements to ensure clean images with edge-to-edge sharpness. This lens is perfect for landscapes, architecture, interior work, and more.